The author of Oh No! There Are Monsters in my Room, Mark Eichler, is offering his first book, The ABC Book of Rhymes, free of charge today, November 3rd, 2013.
a fun way for kids to learn their ABCs and engage the parents too! Get your FREE Copy of the The ABC Book of Rhymes on Amazon Today! A Bully in Monkeyville IS HERE! The much anticipated second children’s book authored by 16-year-old Ari Mazor is finally here! Fred the monkey is not a snitch! Fred is bullied but he is keeping it a secret. When Jason Brown moves to town he is lonely and friendless. Jason does not know how to make friends, so instead he picks on Fred who is much smaller than him. Fred is a good monkey who does not like to fight and does not like to tattle, so he keeps it all to himself. But when Fred stops playing outside and is no longer seen on the playground his concerned friends want to know why. Before long, Fred’s pals, among them Mighty Paul, Little Lizzy, Hairy Bill, Jodi, and Ted figure it all out. They make Fred realize that sometimes ‘telling’ is the right and heroic thing to do, as in the case of bullying. Telling friends, teachers and parents about bullies protects all kids and assures everyone’s safety. – Clothes Have Feelings Too! Author Paul Day, in his story Kipp The Copper Coast Kid engages the readers’ emotions and imagination and transports them to a world where the real and surreal intermingle. Paul Day’s captivating story of young love is set in and around the historical Moonta Mines in South Australia. The geographical setting, which is famous for its Cornish heritage, lends drama and adventure to the story as do the well-developed and rich characters of Kipp, Jane and others. Additionally, the seamlessly interwoven themes of survival, family relationships, commitment and devotion, — that are as contemporary as they are timeless – add yet another dimension to this enchanting tale. 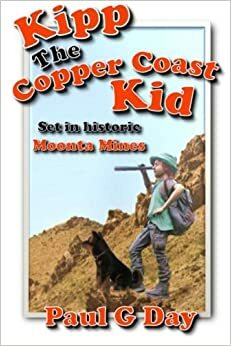 Kipp The Copper Coast Kid is appropriate for children 11 and up. This book is highly recommended as it is guaranteed to tug at the heartstrings of its readers and fill their soul with wonder. Parenting and Children’s Books that Promote Good Values! Hillary Clinton tried to persuade the nation that it takes a village; others deem it the responsibility of government to decide what is good for children; and others yet assign this important task to teachers at schools; I believe that the duty and obligation to parent lies with PARENTS. The breakdown of a coherent value system in our society may be a consequence of the contemporary twisted politically correct, ivory-tower championed “mores” that want personal-accountability and dismiss all that is true and sacred, but be it as it may this offers no defense, no excuse. Parents must teach their children what is right and what is not. Parents have a duty to instill in their offspring fundamental values that will equip them to deal with the many challenges they will confront in childhood, adolescence, and later when they embark on their adult life. The values that parents ought to advocate and model in their own behavior must not be driven by political agenda but rather they should reflect universal and time-tested worthiness: Values such as respect, truthfulness, consideration for others, compassion, charity, cleanliness, hard work and determination, courage, responsibility and reliability, to name several. Parents that embrace a life that is based on good values are wonderful role-models, but more is necessary. Perhaps the most important gift parents can bestow upon their children is to train them to strive to understand choices and instill in them the courage to opt for the right rather than the easy path. One way to work toward this goal is to introduce children to books. Reading to children should begin early, since – as statistics demonstrate – being read to impacts children’s development and significantly improves the probability of their future academic and economic success. Furthermore, when the reading material chosen is of quality, the benefits are greater yet. Stories written well enhance vocabularies as well as the perspicacity for proper sentence structure and correct grammar. Age-appropriate content and storylines refine the mind and sharpen the intellect. And the lessons inherent in stories that promote good values provoke contemplation and foster a healthy and positive attitude toward the self and toward others. This blog is an introduction to a series of future submissions that will promote children’s books that champion specific good values. Authors and readers are invited to suggest and recommend children’s books that fit the objective of this initiative. Mindfulness is being actively and deliberately attentive. It is the antithesis of taking things for granted; a ubiquitous affliction that fosters boredom and gloom. Oh, but to note the fluttering of butterfly’s wings, to appreciate the sound of a child’s giggle, to enjoy the fragrance of morning’s brew! How much joy is forgone as a result of inattentiveness and obliviousness? The good news is that mindfulness is an obtainable skill and an ability that should be imparted to children early in their lives. In “You Are Not Your Thoughts (Mindfulness for Children of All Ages)”, author Brian Despard makes it easy for the young and not so young to espouse ‘mindfulness’. The book is adorable and joyful as it embraces a lightness of being! I highly recommend reading this book with and to children, as all may be richer for the experience. More FIVE STAR reviews for Ari’s Book! ANOTHER 5.0 out of 5 stars Review! Reading this to my children, I couldn’t help but enjoy it myself. It’s one of the sweetest books I have read in a while. It also teaches a great lesson that every parent loves their kids to learn…..CLEANLINESS!!!! If it takes a book to help teach this, I’m gonna grab them all. 😉 l would definitely recommend this book to anyone who enjoys an adorable read. “You’re right” said the shirt to the little sock pair. “We fully agree,” piped shoe one and shoe two.